Fall Slouch Hat Pattern. Size 6 to 10 years. 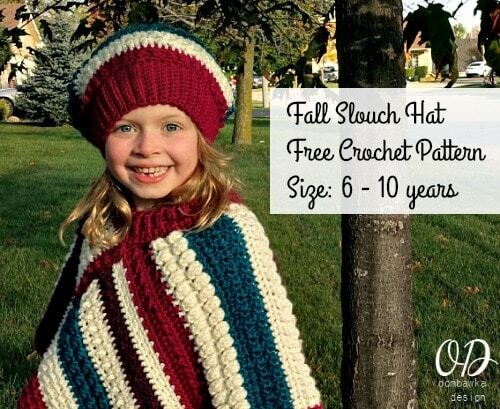 For the other sizes, including the hats using DK Weight Yarn please visit Amy’s Introductory Post! Main Hat: approximately 4 sts / inch using a 6.0 mm hook and Red Heart Soft, Worsted Weight Yarn. If you want a less slouchy hat use a 5.5 mm (I) for the body of the hat; if you want a more fitted hat with only a tiny bit of slouch, use a 5.0 mm (H). Regardless of which hook you choose for the body of the hat be sure to use a 4 mm (G) hook for the brim/band. R3-R69: rep R2 (your brim should now be 14 inches in length unstretched). Do not finish off. Note: From R5-R8, the ch 3 counts as 1 dc in the stitch counts at the end of the row. Or if you prefer, see below for the optional decrease rows to make the top of the hat more shaped/rounded before you weave the final row together to close the hat. Starting at the brim join the edges together. You can choose your favorite seaming technique to do this. Here are some helpful tutorials to assist you. When I join my hats together I use the same color as the section of the hat which I am seaming. If you missed the note at the beginning mentioning you should leave a long tail for each color change this is ok you can still assemble using the same color by attaching the yarn color of your choice after weaving in your other ends.